REP (Resource Evaluation Programme) uses the well-known Monte-Carlo technique for a rigorous solution of the volumetrics equation. The calculation of reserves, and an estimation of the uncertainty of that calculation, lie at the heart of hydrocarbon exploration and production. But REP is much more than “just another Monte-Carlo program”. It has been designed and developed by explorationists and engineers to solve their problems – and these problems are not only in the calculations themselves. The results, and the means by which they are obtained, must be understood by colleagues and management, so that everyone can have confidence in the decisions that follow. Great care and thought has gone into the user interface, and the way the program guides you through the estimation process. Equal consideration has been given to the presentation of results: REP routinely produces report quality output which can, without modification, be made into overheads or included in submission documents. Validation, consistency and understanding are key issues for a company assessing reserves. REP has “reality” plots at both variable and results levels. Tornado and spider plots allow ranking of input variables by uncertainty. Assessing a prospect in a play setting is integral to the program design. Single accumulation volumetrics is at the heart of the program. But commonly an exploration and development programme will include several prospects or fields in a single geological setting. The consolidation module within REP allows these groups to be properly assessed, and the relationships between them investigated. This section handles the calculation of prospect and field reserves. Each of the factors which go into the standard volumetrics equation – gross rock volume, net-to-gross, porosity and water saturation, formation volume factors and recovery factors – are entered as probability distributions. The program has a number of standard distribution shapes built in, or you can define your own distribution. 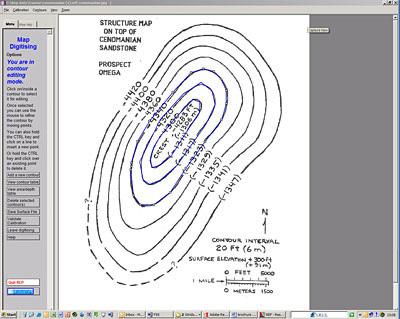 Gross rock volume is often the most uncertain input to the calculation, and REP allows you to enter this either as a single probability distribution, or the product of area, depth and shape factor, or – most commonly – as an area/depth table. 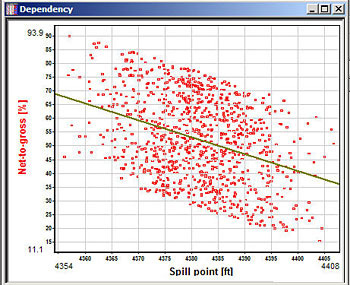 The latter method allows modelling uncertainty in hydrocarbon contacts or spill point, mapping errors and horizon shifts. REP handles the following fluid types: oil, gas, oil and gas, gas condensate and gas condensate with oil. In addition, the you can define an associated gas phase with the oil and an associated oil phase with gas. There are a number of schemes for risking prospects, The most commonly used divides overall chance of success into three categories of play risk and four of prospect specific risk. Risking schemes can be customized to company-specific procedures. Define economic minima (in terms of recoverable oil and gas) for any field or prospect, thus introducing a chance of economic success on top of the chance of technical success. Define dependencies between inputs – for example, porosity on depth, or saturation on porosity. Cascades of dependency, where an independent variable may be itself dependent on another, is also possible. Define a dual porosity system (typically, a fractured carbonate) with separate volumes and recovery factors for the matrix and fracture volumes. Standard correlations for oil and gas properties are included, to help with choice of formation volume factors where they are not more accurately known. 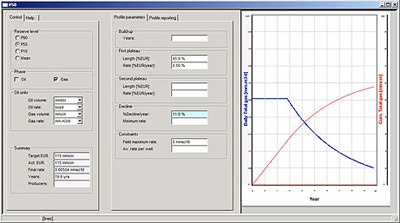 Make quick-look production profiles based on a simple and widely applicable rule-set. 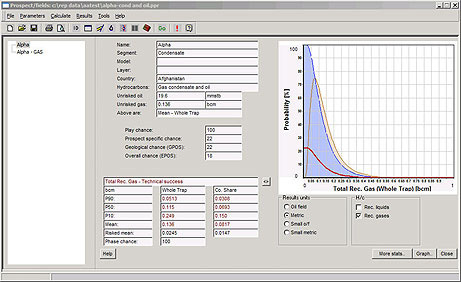 The resulting profile can be launched directly into any spreadsheet program. The on-screen digitisation is an extremely useful and popular facility. Use a scanner, digital camera or even mobile phone to get a contour map on screen, and then trace around the contours with the mouse. The resulting area/depth table can be imported directly into the volumetrics section. Although simple in principle, the Consolidations module is extremely powerful, and opens up a whole new area of evaluation which less comprehensive programs completely ignore. In its most basic form, a consolidation is just the probabilistic addition of input distributions – which are normally prospect evaluations. Individual prospects or fields may be summed to derive lease or on-block reserves. The results of consolidations may themselves be consolidated. In this way, reserves figures may be obtained by play, basin, block, country or any other required sub-division. At the top of the pyramid, a corporate profile can be produced. Perhaps the most important, powerful and frequently overlooked use of consolidations is in evaluating the influence of dependent risks in prospect appraisal. For example, consider a prospect with two segments which share a common source (so that proving hydrocarbons in one segment effectively proves the source in the other segment) but do not share a common seal. Consolidating the two segments with the risks properly linked can give a significantly different result to treating them either as completely independent or as one prospect (i.e. assuming that proving up one segment proves up the other); and this may be the difference between the decision to drill or not. Consolidations are also used to evaluate the results of a single well with more than one horizon, and drilling programs.